This page is all about how I got my building permit (or got planning permission as it's know in the UK and Ireland). I use both terms - they both mean the same thing really - the paperwork you need before you can start building. In most places you can’t just start building your home. Permission is required to make sure that your proposed home design has a suitable aesthetic and won’t be an eyesore and to make sure that building regulations are followed. It took quite a while for our planning permission to come through. It's a long story but it will give you an idea of how tricky the process can be. Let me fill you in with the lessons learned, then you can go ahead and read the whole story. Keep your neighbors informed about what your plans are, but make sure you are designing your home and not them. The process of getting a building permit can put you at odds with your neighbours. It's a risk you have to take. If during the process of getting your building permit changes are required to your design don't forget to look at the design as a whole. When planning restrictions meant that we had to reduce the size of our plan on the East side of the house, we were so focussed on the East side that we forgot to take into account how the rest of the plan needed to adapt to the changes. We had to make a few changes during the build which is always best avoided. Hopefully planning won’t take long, but it could take ages. Have a contingency plan in place in case your project takes a long time to get through planning. We were fortunate in that our house was habitable, although we had to put up with some questionnable décor but we weren’t trapped paying a mortgage and paying rent at the same time. We got hit by extra fees from our architect who had to do extra work to get us through the planning process and there were also the fees of the planning consultant. The moral of the story is, have a contingency amount for your professional fees as well as the contingency in the budget of your build. All the documentation is available as public record. To put the picture above in context let me start with a run down of the process that I went through to get my building permit here in Ireland. Take the time to find out how planning permission works in your area and the timeframe's involved. Step 1 - Submit planning application to the local council. Step 2 - Anyone wishing to object to the development (any member of the public) must do so within one month of the submission date. Request changes to the design in order to grant permission. Further to this a new design must be submitted within 6 months and permission will be granted or refused 4 weeks after the submission of the new design. Step 4 - If the homeowner or a neighbour on land adjoining the property aren’t happy with the decision of the local council then they may appeal to the planning board. Step 5 - Other parties (home owner or neighbours with land adjoining the property) may submit documentation to rebut the appeal within a month of the appeal submission. Request changes to the design in order to grant permission. If necessary a new design must be submitted to the local council for approval in line with the changes requested by the planning board. 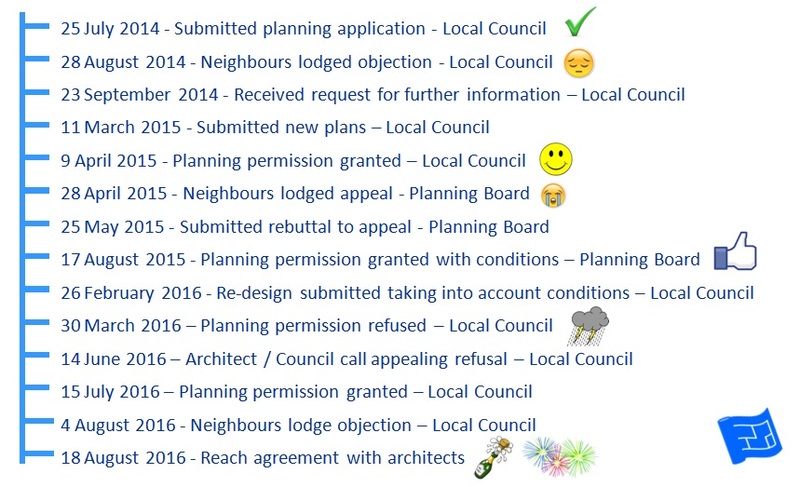 So by my calculations here’s the range of timeframes for getting planning permission. The shortest time - 9 weeks (get permission from local council and wait 4 weeks to make sure there are no appeals to the planning board. The longest time – 28 weeks (if both bodies (local council and planning board) place conditions on granting permission). That includes just a week each for redesign at each stage. It took us over just over 2 years!! You can probably get permission to build a skyscraper quicker. When you’re planning to do some building work on your home there’s always the neighbours to consider. Along with considering the impact that your future home design will have on their enjoyment of their home and garden there’s also the question about how to go about informing them about your plans. Our architect said that from his experience the best approach is to design your new home (it is your home after all and not your neighbours) and then, as a courtesy, give them a copy of the plans once they’re finalised and ready for the planning application. That’s their right and all part of the process but it was frustrating to find out this news through the local council rather than our neighbours reaching out to have a conversation with us. Looks like getting my building permit might not be as easy as I thought. We received a request from the council to change the design slightly, essentially reducing the size of our addition on the east side by 1m. Thinking back I can’t think why it took us so long to get the new plans back into the council. There was a 6 month deadline which we just met. Life - we were busy. Success – In theory I've got my building permit :). Now we just have to wait a few weeks to make sure that there are no appeals lodged. I don’t believe it. Again after a month of radio silence from next door, they lodge an appeal with the planning board. Their submission was written by a planning consultant which means we’ll need to hire one to shoot back. I threw myself into reading the appeal submitted by the neighbours and sending everything off to our planning consultant. Here’s our rebuttal (warning - it's a big file - 14MB. We had a lot to say). Another hurrah moment. My building permit is granted by the Planning Bord. There’s a few conditions, one of which will have quite a big impact on the design: we’re not allowed to build anything that comes further forward than the current building line of the building. This is a bit of a blow because it essentially means we can’t build our garage and we need that garage and it needs to be attached to the house. We need to redesign, pushing the garage into the footprint of the house. We submitted the plans to the Local Council but they refused to ratify them because the order from the Planning Board didn't direct them to do so. With out neighbours so much on our case it was too much of a risk to build anything without approval from the Planning Board but it took a long time to get an amended ruling to force the Local Council to review the plans. The re-design made a few key differences in the plan. Here's the new plans. The mass of the building at ground floor level crept a bit further towards the neighbour's house and we added a few windows upstairs – a bit cheeky perhaps but they were above eye level and opaque. WTF!! Denied. This came as a huge blow. This one isn’t down to the neighbours. What’s going on with my building permit? We ask our planning consultant to contact the local council to find out what the problem is. We chase and chase, for some reason that we never got to the bottom of he wasn't making contact with the council so we hand over to our architect. Our architect calls the council who admit that the current building line has been misinterpreted so the decision to refuse permission is an error. But it seems like the council don’t want to lose face because they won’t reverse the decision, we’ve got to put the drawings in again. And wait another month for a decision. At last, the champagne moment. Planning permission granted and we’re at the end. Or so we thought. Next thing we know there’s an email from the neighbours complaining about the new design and threatening to write to the Planning Board. Enough already. I was fuming. At this point we did have a meeting with the neighbours. It wasn’t constructive. I need to find another way to get my building permit sorted out. So our architect meets with their nominated architect and they sort things out between them. We remove the windows and the wall moves by 6 inches – give me a break. But I don’t care – because I have my building permit and now we can start building.